Classic Eclairs – crisp hollow golden brown shell filled with creamy vanilla custard-like filling, topped with a simple chocolate ganache. A dessert that will wow the crowd at your next gathering! 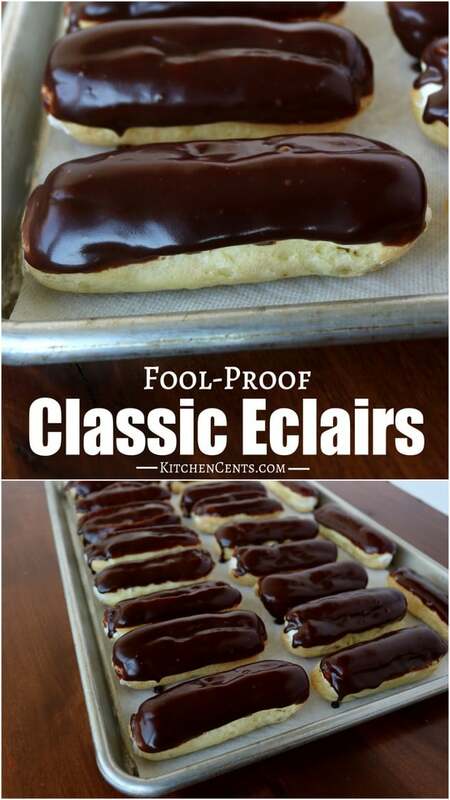 How do I make the eclair shell hollow? This recipe is really cool and will make a hollow shell as it bakes. It’s kind of like magic. The dough-like mixture is filled with eggs which, while it cooks, creates air pockets as it puffs up. When the shells are done they will be hollow or practically hollow and ready to be filled with delicious cream. Can I use the shell recipe to make cream puffs (round balls filled with cream and sprinkled with sugar)? Yes! You can use this recipe to make your own cream puffs. You can also use the same cream filling. Just omit the chocolate and sprinkle with powdered sugar… you have a delicious cream puff! We love eclairs but cream puffs are great too. If you plan to serve a crowd, cream puffs are great because they are very “stackable” (no sticky chocolate). You can make them large or small, bite-sized puffs. Bake time will vary depending on what size eclair or cream puffs you make. This recipe is for 18 large eclairs. How hard is it to make the chocolate ganache? Chocolate ganache is a simple, elegant touch you can easily add to chocolate desserts. This simple ganache is made from 2 ingredients, cream, and chocolate. That’s it! If you like sweeter chocolate you can use milk chocolate. If you’re a dark chocolate lover, you can use dark chocolate. To make this simple chocolate ganache you add 1 part cream to 2 parts chocolate. Melt in the microwave 30 seconds at a time. It usually only takes 30 seconds to a minute to get warm enough. Stir… and stir until the cream is incorporated into the chocolate. It will become shiny, rich chocolate color when it’s ready with now signs of cream or white streaks. It takes a minute or two of constant stirring to get the cream incorporated. 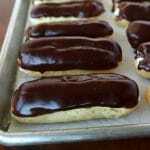 What piping tip should I use to make classic eclairs or cream puffs? You can find the full printable recipe below. ENJOY! Crisp, golden brown shells filled with creamy vanilla custard-like filling, topped with a simple chocolate ganache. In a large saucepan bring to boil, water, milk, butter, salt, and sugar. Once butter is melted, reduce heat to low, add flour, and stir vigorously. Remove from heat. Let cool to 125-135 degrees (hot to the touch but not burning). Add eggs, one at a time. Incorporate completely before adding the next egg. Add 5 eggs until the mixture turns into a soft paste that will still hold its shape. Using a plastic piping coupler or piping tip of your choice (large opening) and Ziploc bag, immediately pipe paste in the desired size (small- 2-3 inch, medium 4-5 inch, large 5-6 inch, cream puffs- round balls). Bake time will vary depending on size. 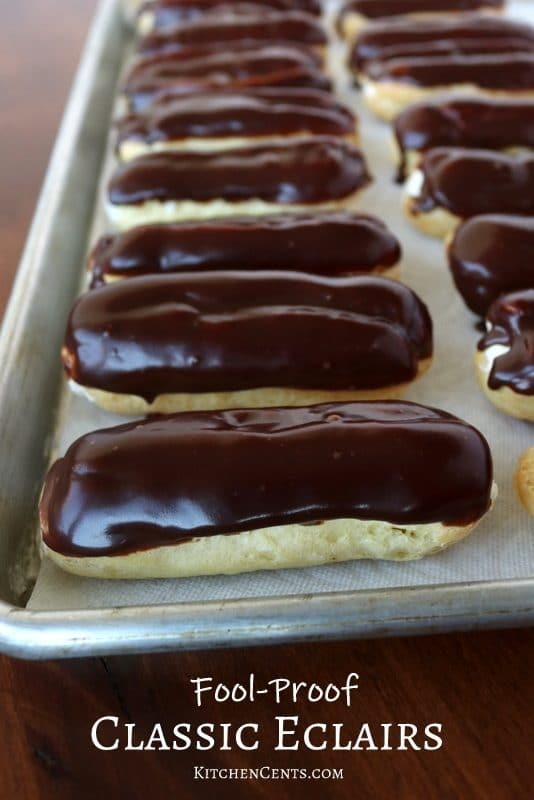 For large eclairs, bake at 425 degrees for 15 minutes then reduce the heat to 375 for 12-20 minutes until the shell is golden brown and hollow inside. Whisk pudding mix and milk together. Mix 2-3 minutes. Set in fridge until ready to use. In a large mixing bowl, whip cream to soft peaks, add powdered sugar. Whip to stiff peaks. Don't over whip or you'll end up with butter. Remove pudding from fridge. Stir until smooth. Fold in whipped cream. Using a bag with round piping tip, carefully insert tip into cooled shell. Fill slowly until shell is full. You may need to fill from both sides to fill entire shell. In a microwave-safe bowl, add cream and chocolate chips. Heat 30 seconds at a time, stirring in between, until melted. Usually only takes 30 seconds to 1 minutes. Don't over heat. Stir chocolate mixture until cream is fully incorporated into chocolate. Mixture will look rich, smooth and chocolatey when done (1-3 minutes). 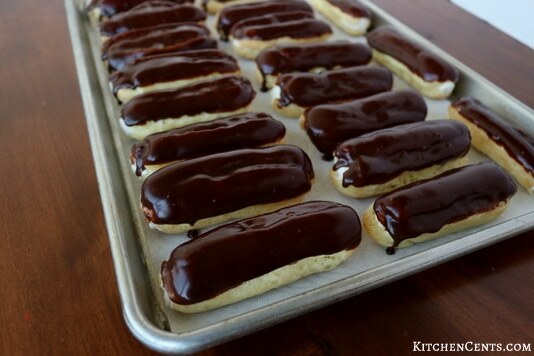 Dip top of each filled eclair into chocolate ganache. Let ganache cool. Store in fridge or freeze for later. Best if served fresh but can be frozen for later enjoyment. If frozen, allow elcairs to come to room temperature before enjoying. Great recipe. I thought it would take longer than it did to make these. We filled some with pudding and others with whipped cream. Yum! Thanks, Becky! We love this recipe. It is a fairly quick recipe to make. Did you know you can even make the shells ahead of time, freeze them, then when you’re ready to make them you just pop them in the oven just until they crisp up. It makes for an even fast dessert when you’re in need of one. 🙂 Happy baking!